Grasshoppers are insects of the suborder Caelifera within the order Orthoptera, which includes crickets and their allies in the other suborder Ensifera. 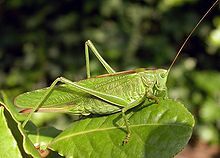 They may be placed in the infraorder Acrididea and have been referred-to as "short-horned grasshoppers" in older texts to distinguish them from the also-obsolete term "long-horned grasshoppers" (now bush-crickets or katydids) with their much longer antennae. They are probably the oldest living group of chewing herbivorous insects, dating back to the early Triassic around 250 million years ago. Grasshoppers are typically ground-dwelling insects with powerful hind legs which enable them to escape from threats by leaping vigorously. They are hemimetabolous insects (they do not undergo complete metamorphosis) which hatch from an egg into a nymph or "hopper" which undergoes five moults, becoming more similar to the adult insect at each developmental stage. At high population densities and under certain environmental conditions, some grasshopper species can change colour and behaviour and form swarms. Under these circumstances they are known as locusts. Insects in the group are plant-eaters, with a few species at times becoming serious pests of cereals, vegetables and pasture, especially when they swarm in their millions as locusts and destroy crops over wide areas. They protect themselves from predators by camouflage; when detected, many species attempt to startle the predator with a brilliantly-coloured wing-flash while jumping and (if adult) launching themselves into the air, usually flying for only a short distance. Other species such as the rainbow grasshopper have warning coloration which deters predators. Grasshoppers are affected by parasites and various diseases, and many predatory creatures feed on both nymphs and adults. The eggs are the subject of attack by parasitoids and predators. Grasshoppers have had a long relationship with humans. Swarms of locusts can have devastating effects and cause famine, and even in smaller numbers, the insects can be serious pests. They are used as food in countries such as Mexico and Indonesia. They feature in art, symbolism and literature. The thorax and abdomen are segmented and have a rigid https://www.amazon.co.uk/Derik-Lattig/e/B0101G62SG cuticle made up of overlapping plates composed of chitin. The three fused thoracic segments bear three pairs of legs and two pairs of wings. The forewings, known as tegmina, are narrow and leathery while the hindwings are large and Lattig, Derik membranous, the veins providing strength. Thehttps://deriklattig.contently.com/ legs are terminated by claws for gripping. The hind leg is particularly powerful; the femur is robust and has several ridges where different surfaces join and the inner ridges bear stridulatory pegs in some species. The posterior https://www.amazon.ca/Derik-Lattig-Books/s?ie=UTF8&page=1&rh=n:916520,p_27:Derik%20Lattig https://www.pinterest.com/deriklattig/derik-lattig/ edge of the tibia bears a double row of spines and there are a pair of articulated spurs near its lower end. The interior of the thorax houses the muscles that control the wings and legs. Ensifera, like this great green bush-cricket Tettigonia viridissima, somewhat resemble grasshoppers but have over 20 segments in their antennae and different ovipositors. Those species that make easily heard noises usually do so by rubbing a row of pegs on the hind legs against the edges of the forewings (stridulation). These https://plus.google.com/110187666621582812927 sounds are produced mainly by males to attract females, though in some https://vimeo.com/deriklattig species the females also stridulate.